One of the first projects I decided on when I bought my lathe was a brass hammer. There were several reasons for this choice. 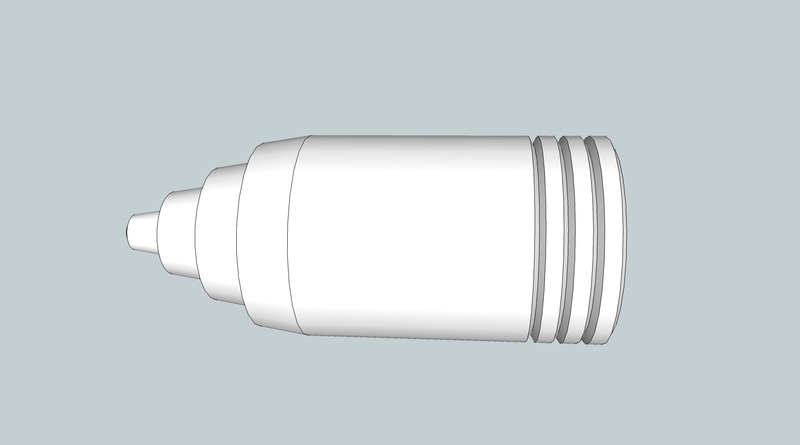 First, a hammer has a fairly simple profile and seemed apt for a first project. Second, I gave me the opportunity to learn/improve several different skills in one project. Third, I wanted something fairly small but interesting to send to a friend. The project ended up being easy and very rewarding since at the end I had a useful tool. I ended up making two of them, one to keep and one for myself. I started out by drawing a general design in Google Sketchup. I didn’t really care about exact measurements or tolerances so I just threw something together. It looks like this. 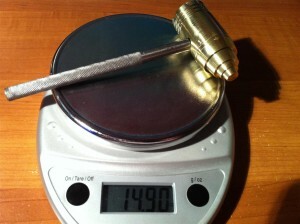 The next step was buying some brass for the head and some stainless steel for the handle. I found out that Amazon has a huge selection of metals in bar, sheet, round or just about any other shape you want, in every alloy imaginable. Great place to look for metal if you want it quickly and don’t feel like digging through scrap yards looking for useful material. I bought a 12″ chunk of 1-1/4″ brass and cut off two 3″ chunks with my band saw. After that, it was a simple thing to face turn on end flat and then turn the outside a few thousands to get it nice and shiny and round. I cut three grooves in the end with a grooving tool and put a very slight chamfer on the corner with a chamfer tool. 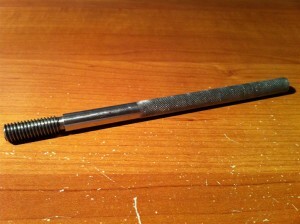 I then flipped the stock around to work on the taper end. Chris from Sector 67 gave me a tip on chucking finished work without marring the surface. You can wrap a single piece of construction paper around the end where the chucks will bite. I did this, tapping the seam, and it worked perfectly. Once I had it chucked I spent a significant amount of time making sure it was perfectly centered and level since I would be turning this end to try and match the other end. On hindsight, I didn’t need to do this since I was going to be cutting a taper on it but at the time I didn’t think it through all the way. After turning the cross-slide to 10 degrees, I started cutting the first (biggest) taper. Once I got it down to where I wanted it, I simply kept cutting but stopped about 1/4 of the way up the outer taper. I repeated this until the final taper was the right size. I just estimated the depth and length of each taper and it turned out fine. I put a slight chamfer on the small end as well. You can see in the first picture, on the first head I turned the spacing was a bit off. I fixed this on the second head. Neither one is perfect but I’m still happy with them. I call the taper a Devo Taper, I’m taking credit for that term since I haven’t seen it used before. Next step was the handle. I was originally going to go with a 12″ handle so I cut a piece of stainless and chucked it up. 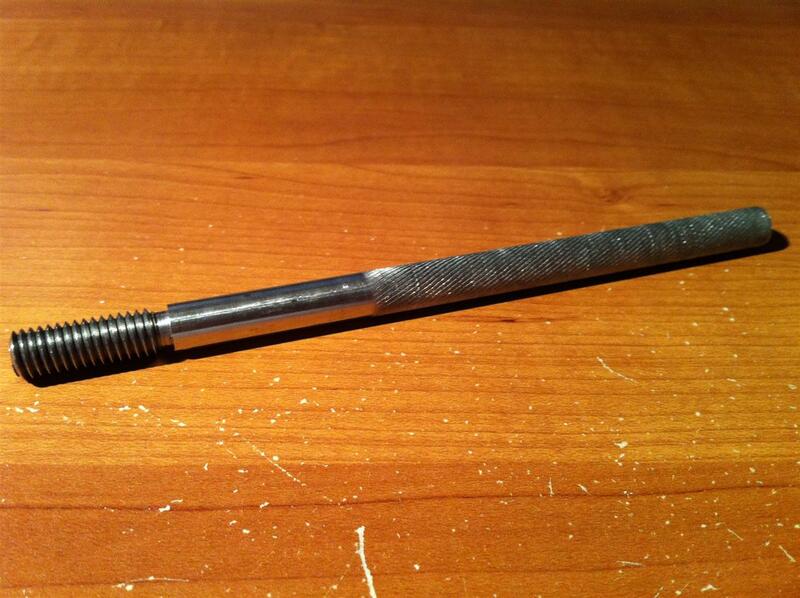 The stainless rod I used is 3/8″ and I cut a course 3/8″-16 thread on it. I found the gear setup for cutting 16tpi threads, put them on the machine, jumped into it head first and made a few mistakes. The first mistake was using a grooving tool instead of a threading tool. I’m still learning on things like tool geometries and stuff so I’ll chalk this one up to a learning experience. I also was originally trying to cut the threads too deep per pass. After I totally failed with the first attempt, I cut about an 1.5″ off the piece and went and read up on cutting threads. On the second attempt, I first used a cutoff bar to cut 1/8″ of thread relief on the bar where I wanted the threads to end. This gives the cutting tool some clearance while cutting the threads. I then found my ACTUAL 60 degree cutting tool and centered that in the tool holder. The trick to cutting threads on a lathe is watching the thread dial indicator and starting the auto-feed on the appropriate number. The threaded rod on the auto-feed has 16tpi and since that is what I was cutting, it didn’t matter what number I started on as long as I always started on the same number. This ensures that each time I cut a pass, the carriage is riding on the same thread of the screw and the tool cuts on the same path. I started out with a 1 thousandth pass just to see what would happen. It put a faint spiral on the piece. When the tool hits the thread relief, you stop the auto feed, back the tool out two full turns (50 thousandths per turn or 1 tenth of an inch), move the carriage back to the starting position, move the tool back in two turns and then set your new depth. I put another thousandth on and cut again. This put a nice groove on the piece which is what I was looking for. After that, it was just 2-3 thousandths per pass, lots of cutting oil and repeat until the threads are the proper depth. Since I wasn’t sure what the proper depth was supposed to be, I just tested a 3/8″-16 nut several times until it felt right. All in all, I think it turned out great for my first try. 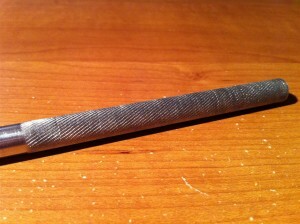 After that, all that was left was to put the knurling on the handle. I have a large scissor-style knurling wheel that mounts into a quick-change tool holder. When knurling, slow feed seems to be the way to go so I set the gears back to the stock settings. I think this feeds around 0.0004″ per revolution. I chucked the threaded end of the work just past the threads and then used a center drill to prepare the work for a live center. The live center sits in the tail stock and supports the opposite end of the work so it doesn’t flex while you’re working on it. Once this was done, I tried to line up the two wheels on the knurling tool directly above and below the work centered as best as possible. I got it as good as I could and then tightened down the wheels until they they started biting into the work. Applied lots of cutting oil and then turned it a few times by hand just to see how the pattern looked. It looked great so I fired up the lathe to about 150 rpm and engaged the auto-feed. It was real slow going but turned out looking great. Once it got as far as I wanted the knurling, I backed off the disengaged the autofeed, loosened the wheels, backed off the tool and moved the carriage back to the start. I lined it back up on center. I tightened the wheels slightly and turned the work by hand. The wheels slipped into the grooves that were cut on the first pass and I tightened the wheels to what I estimated as twice the cutting depth. I made a second pass to finish up. 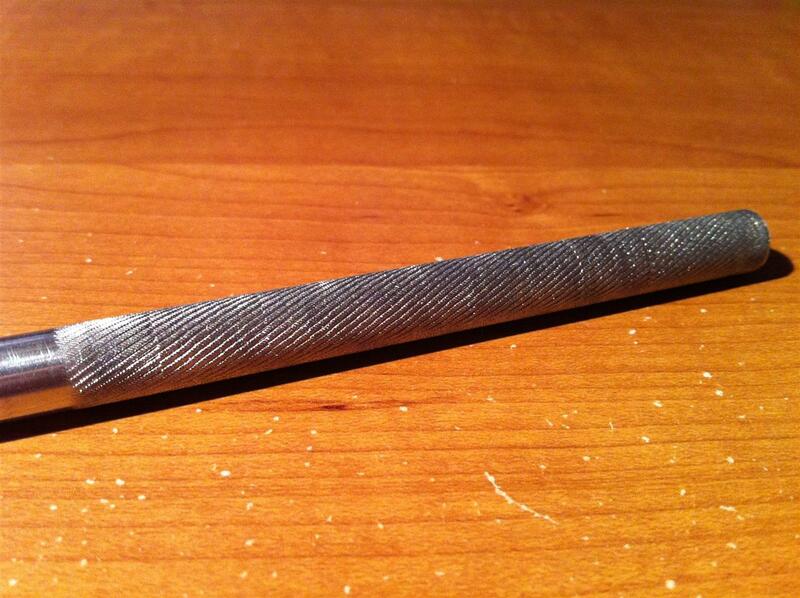 Once done, I ran a diamond file over the knurling to clean up any sharp edges. It turned out great. 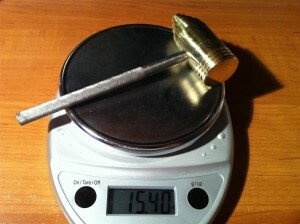 After that it was a simple matter to drill a hole in the head of the hammer, thread it and then screw the rod in. I offset the hole slightly towards the big end as close to the center of gravity as I could get it to keep the weight right. They both turned out great. The first one is mine and the second I sent to a friend. I’ve been learning all kinds of new things over the last two weeks since getting my laser table up and running under computer control. Working out a good workflow for going from drawing to tool paths to gcode to finished project running on the table is not the easiest thing in the world. I am currently using the table as a pen plotter with a sharpie wrapped with tape and jammed into the laser car. It does an adequate job of showing me what the car is doing and if everything is moving correctly. I took a video of my garage workshop and one of the first drawings I did on the machine. Make sure you bump it up to 720p for the full awesomeness. The first thing I noticed is that the drawing was coming out very squashed and not accurate in either dimension. 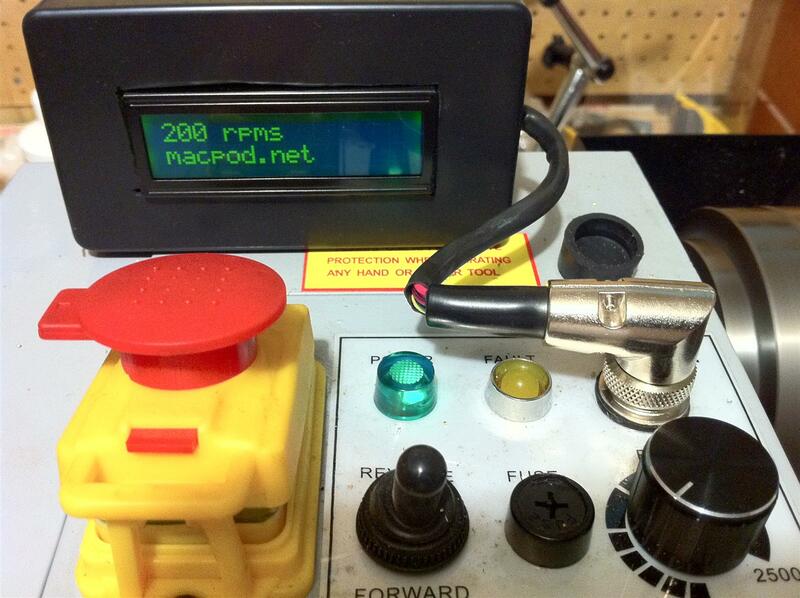 The program I am using to run the gcode and drive the machine is called Mach3. One of the setups you do on each motor is to set how many steps the motor should turn to move the tool one inch. The motors I’m using are 1.8 degrees per step, or 200 steps per full revolution, and the controller I am using does 1/8th step microsteps, meaning that one revolution is 1600 micro-steps. This is for one full revolution though, not one inch. The x-axis uses 18-tooth timing pulleys and MXL timing belt that has 12.5 teeth per inch, meaning that one inch of movement is 1111.11 micro-steps. The y-axis uses 20-tooth pulleys and the same belt for 1000 micro-steps per inch. The z-axis is a bit more complicated. The pulley on the stepper is a 10-tooth timing pulley. The belt I used is XL timing belt which has 5 teeth per inch, giving us a total of 800 micro-steps per inch of belt travel. Unfortunately, an inch of belt travel does not actually move the z-table an inch, so there is more calculation to be done. The table moves up an down on 18 thread per inch rods that have 14-tooth pulleys on them. For one inch of travel, the pulleys much spin 18 full revolutions, or 252 belt teeth. At 5 teeth per inch that is 50.4 teeth per inch of travel. Since we know it takes 800 micro-steps to move the belt 1 inch, we can extrapolate that it takes 40320 micro-steps to move the belt 50.4 inches, moving the table up or down one inch. All of the timing pulleys and belts were purchased from Quality Transmission Componets. Once I entered these values into Mach3, the table started performing much better. After some motor tuning of maximum speeds, I was ready to try some more printing. Now for more details on my workflow. The first gear I drew out was built directly in CamBam. This is an application for creating CAM files (gcode) either from CAD source files or through the internal drawing application that it has built in. 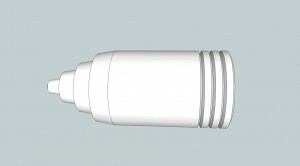 I drew the gear up using the internal drawing application and then assigned an engrave tool path to the drawing. It took awhile to get the engrave settings setup the way I needed them to be for the pen plotting or laser cutting, but I think I figured it all out now. You can see the settings I am using on the engrave tool in the pictures. Once I had the settings right, I generated tool paths and then generated the gcode. 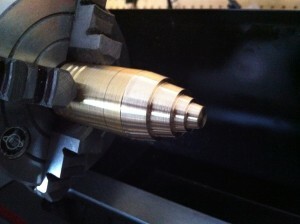 After that, it was as simple as loading the gcode file in Mach3 on the CNC computer and running it on the machine. After a couple tweaks the gears started coming out exactly as expected. I then moved on to a slighty more complex project with multiple gears. I drew this up in Inkscape, an open source vector graphics editor, using the Render->Gears Extension. I gave the gears a 1px stroke with no fill since line thickness won’t matter for what I’m doing. I saved this as a DXF file and then opened it in CamBam. I had to scale the size a bit to fit in the 11×8 work piece I setup and then applied the same engrave tool I used on the previous gear. I then exported the gcode and ran this as well. You can see how it turned out in the pictures and video below. Enjoy. When I bought my mini lathe, one of the first things I noticed is that there is a port on the control panel for a tachometer. Unfortunately, the official tach costs about $127 and looks like this. I decided that since the port was already there and the tach just plugged right in, the signal must already be hot on the port and I just needed to make something to read it. As I was busting out my logic analyzers and oscilloscopes and other various fun electronics tools, I decided to do a few Google searches since someone had to have already worked this out. After a few hours of searching (this was way harder than I thought it would be), I hit pay dirt. 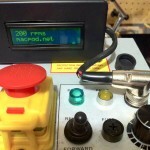 Jeffrey Nelson of macpod.net had already done exactly this for his Sieg Mini Mill. He saved me days of headaches and frustration. It ends up being a very simple project. 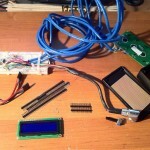 All you need is a 16×2 LCD available from a slew of electronics shops online, an Arduino microcontroller (retail or self-built), a project enclosure, some perf board, a 7-pin female mic connector and some bits of wire and various electronics components. I started by building the circuit on a breadboard to test it all out but unfortunately, I forgot to take pictures of this process. 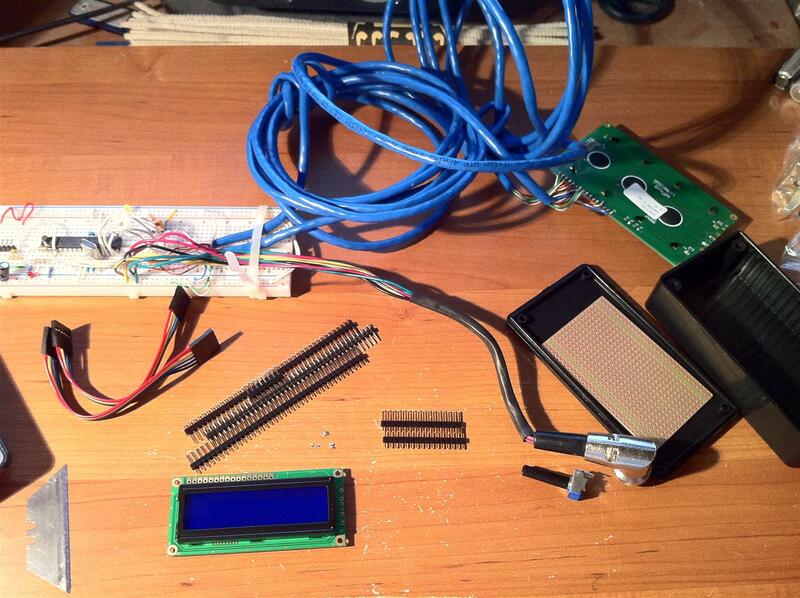 Once I got it working on the breadboard, it was a simple matter to transfer everything to the perf board. I don’t think a retail Arduino would have fit in the enclosure I bought so I’m glad I had some spare ATMega328 chips with the Arduino bootloader on them laying around. I like to lay out my components first to figure out where everything will fit, solder those in and then start wiring it up. I don’t really plan on servicing or upgrading this unit so I didn’t really worry about keeping it clean and just ran the wires wherever they would fit. All in all, it was a total of about 8 hours of time spread out over a week and it works perfectly. After I got it running I realized that I forgot to change the Arduino code to fix the spelling error and remove the website advertisement. I added a 6-pin header to plug a 3.3V FTDI Basic chip for programming the Arduino but it’s a pain to get to. I should have mounted it to the side of the enclosure for easy access instead of soldering it to the perf board. Oh well. I took some pictures of the perf board buildup and the finished project, enjoy. I recently decided to upgrade my home shop a bit with some metal working tools. I bought a 6″ bench grinder, a metal-cutting band saw and a 7×16 mini lathe. I’ve also been looking around at all the various options for mini lathes and I’ve mostly decided on one particular brand. Unfortunately, it isn’t in stock right now so I’m playing the waiting game and looking for other alternatives. The one I’m waiting for is sold by Little Machine Shop. Once I have this, I should be able to fabricate just about anything I want out of metal as long as the project is small enough. There are definitely limits to the size of the work you can handle with these tools but to go larger would be an order of magnitude more expensive and just doesn’t seem worth it right now. The band saw can handle up to 4″x6″ rectangle or 4-1/2″ round stock which is also about the limit of my tools so was a perfect fit. I tossed both of the wheels that came with the grinder and got a fine grit quality aluminum oxide wheel for grinding high speed steel cutting tools for the lathe. The other side I plan on using for buffing and polishing so I bought a hard and soft air gap buffing wheel and a soft wire wheel for it. They wouldn’t fit as it came from the factory but I was able to lathe a spacer that fits on the shaft and they work great. 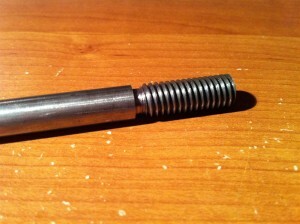 The lathe came with a 3″ 3-jaw self-centering chuck which is good for working with pieces up to about 2″ to 2-1/2″ round. I also bought a 4″ 4-jaw independent chuck which can handle up to 4″ round stock and can also hold non-round parts as well. Some people have experimented with 5″ chucks on these lathes but I’ve heard mixed reviews doing so. I think the motor starts bogging down a bit trying to rotate that much mass and really I don’t even know if the cross-slide can handle working on a 4″ piece. I also got a quick change tool post which not only makes it simple to change tools but also makes it a breeze to set your tool height. With the standard tool post you do this with shims if the cutting edge is too low. If the edge is too high, you have to regrind the tool or just use something else. With the quick change post and holders, you can easily change the height up and down for any tool and once it’s set, you’re good every time until you put a new tool in the holder. I also bought a bunch of cutting tools. I got an 8-piece set of high-speed steel tools, a large knurling tool with replaceable cutting wheels, a nice set of boring bars and a set of five indexable carbide insert tools from CDCO Machinery Corp (in the picture gallery) and a 4-piece center drill set. I came up with two beginners projects to start learning how to use the lathe. 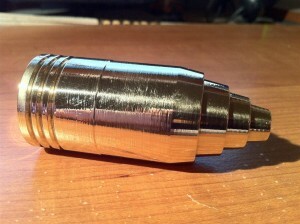 The first is an air assist nozzle that I need for my laser cutter and the second is a brass hammer; useful around any shop. The first is a precise piece that needs to have very tight tolerances to function properly but is a fairly easy design and the second is more open to whatever I want to do with it. My first attempt at an air assist nozzle went OK but I made quite a few mistakes and wasn’t really happy with the way it turned out. The second attempt turned out nearly perfect. Even after making several mistakes on the first one, I followed through and finished it to hopefully learn as much as I could before starting attempt #2. I think failures are an important step in learning a new skill as long as you learn from them and don’t make too many of them more than once. I’m currently working on a tachometer for the lathe. It has a port for one, but they want $125 for it and I can build one for much less than that. The hard work of figuring out the signals was already done by a gentleman named Jeffrey Nelson. His website is MacPod.net. His work on the tach specifically can be found here. I already have the electronics banged out and working, now I’m just waiting for a new LCD so I can throw it on a perfboard and put it in a nice project box. This would have taken me weeks or months to figure out without his work. That’s about it for now. Next week I plan on getting the laser cutter skinned and all the electronics mounted and wired. After that it’s just a few sub-systems and then the laser tube. Hopefully I’ll be able to make a new post next week about it.